Boston, Mass. -- Senior forward Kelli Stack (Brooklyn Heights, Ohio) scored the game-winning goal 11:57 into overtime to propel No. 2 seed Boston College to a 3-2 victory against No. 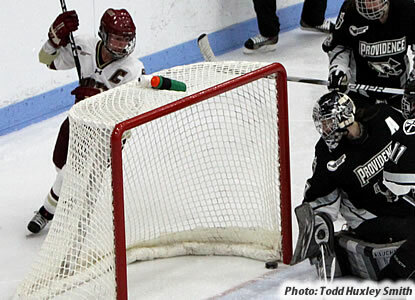 3 seed Providence College in the second WHEA semifinal game on Saturday afternoon at Walter Brown Arena. With the game knotted, 2-2, in the extra session, Eagle captain Kelli Stack snuck the game-winner just through the goalie's pads off the post and over the goal line for her league-leading 34th goal of the season. The sudden death strike came after PC's goalie Genevieve Lacasse (Scarborough, Ont.) had exhibited one of the greatest goaltending performances in conference history, stopping a career-high 58 shots, which also a new WHEA Tournament record, after NU's Florence Schelling's 44 saves earlier in the day broke the record of 41 stops. Boston College (22-6-6) advances to its third WHEA Championship Game in the tournament's history and will face off against Northeastern on Sunday, March 6th at 1pm in the ninth Hockey East Championship Game in league history. Both of the schools are looking for their first league championship in school history. Providence falls to 22-12-1 with the loss. Lacasse established a new Providence College record for career saves despite just three seasons under her belt. Her new mark of 2,582 surpasses the old record of 2,555 set by Jana Bugden in 2006. The career record fell with 2:32 in the second period, with Lacasse's 32nd save of the game. BC's Molly Schaus (Natick, Mass.) finished the game with 27 saves in her 22nd victory of the season for the Eagles. PC took a 2-1 lead less than two minutes later. At 11:14, with a BC penalty expiring, freshman Rebecca Morse (Westfield, N.J.) blasted a slapshot from the left point. The rebound kicked to the left of the crease where junior Abby Gauthier collected, wheeled, and fired into the back of the net despite falling to her knees in the process. 2-1 Providence. The Eagles answered moments later. At the 14:02 mark, freshman Taylor Wasylk (Port Huron, Mich.) redirected a pass for the game equalizer. After several more quality chances for both teams, the clubs headed to overtime. BC nearly ended the contest at the 8:55 mark of the extra time when junior Mary Restuccia (Chester Springs, Pa.) charged in on a breakaway. Again, Lacasse was ready with the save. After two scoreless periods, the Friars found themselves being outshot, 34-14, yet very much in contention thanks in large part to the goalie's heroics. Finally, at 6:35 of the third period, Eagle Melissa Bizzari (Stowe, Vt.) solved the riddle with a rising wrist shot from the left circle. The puck rose over the goalie's left shoulder for the 1-0, BC advantage. Back-to-back Eagle penalties helped the Friars break through at the 9:36 mark. Enjoying a 5-on-3 advantage, the Friar points patiently passed back and forth along the blue line. Eventually junior Jennifer Friedman (San Gabriel, Calif.) uncorked a slapshot from the left that hit the top right corner of the net cleanly. Sunday's WHEA Championship Game will be televised by NESN on tape delay at 4pm after coverage of Boston Red Sox baseball.